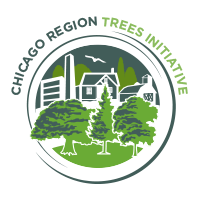 The Chicago Region Trees Initiative is committed to improving the regional forest using a system of Science to Action. Prior to setting specific, measurable goals, CRTI work groups are collecting and reviewing research on trees and land managers in the Chicago Region. The resources that we have collected to date are described here, along with their influence on CRTI projects. By combining forest composition, canopy cover, operational capacity, and socio-economic data, we are able to start looking for patterns and identifying priority areas for improving the urban forest. We are currently analyzing all of the information we have to establish areas within our region with the greatest need and interest for capacity building and tree planting and stewardship. Click on your community in the map below to learn more about your canopy cover! You can also view a Municipal Canopy Summary for your community here.